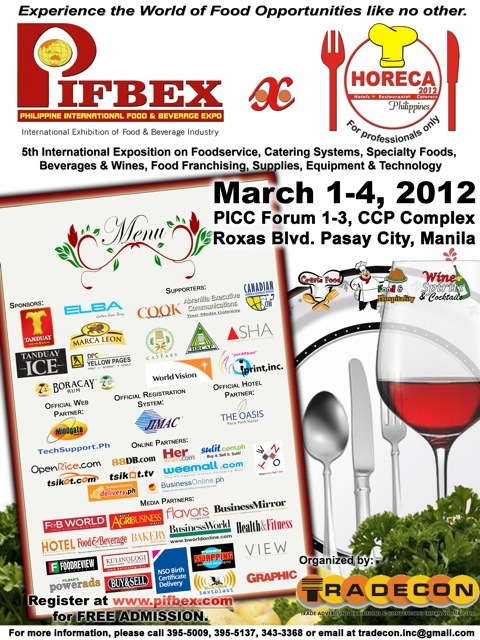 Starting today March 1 until March 4, Philippine International Food & Beverage Expo (PIFBEX) will be having their 5th International Exposition of food service, catering systems, specialty foods, beverage and wines, food franchising, supplies, equipment and technology. 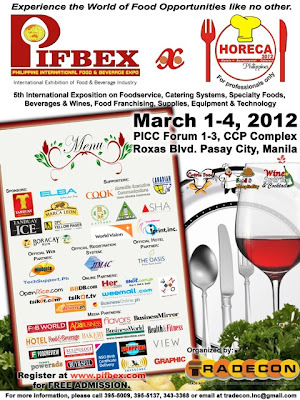 The 4 day expo is located at PICC Forum 1-3, CCP Complex, Pasay city. Food enthusiast, food lovers and experts are all welcome to witness the event that caters all matters about food and beverage. The 1st PINOY JUNIOR MASTERCHiEF Kyle Imao will grace the PIFBEX. The first Pinoy Junior Masterchef will be in the midst of major players in the food and beverage industry. The 12-year old champ will do the ribbon cutting for Tradecon as it launches its 5th annual Food and Beverage Expo and HORECA (Hotel, Restaurant and Caterers Expo) which will run until March 4. Over 300 exhibitors will be present at the expo, including both local and international suppliers, distributors, and manufacturers. International exhibitors from Indonesia, Malaysia, Thailand, Vietnam, Korea and the United States will also showcase their products .For more information, log on to pifbex.com or call 395-5009.